Similar to an IDPA match but firearm used is a shotgun. Stages include steel and clay targets. One stage is usually a “Walk and Stalk" stage where targets are engaged from shooting boxes with no preview of the stage (blind). Most stages will have about 12 targets and the "Walk and Stalk" up to 25. Reloads are on the clock and minimum 5 round capacity shotgun but no maximum limit on capacity. Hunting and home defense shotguns are welcome. Please remove plugs from hunting shotguns to allow 5 shells (4+1) to be loaded. See below in the More Info section for additional match information. A typical practical shotgun stage. Poppers hiding behind barrels requiring different shooting locations to engage all the targets. Typically 5 stages with a combination of clay and steel targets. May include Texas Star, poppers, plate rack or flipping targets as well. 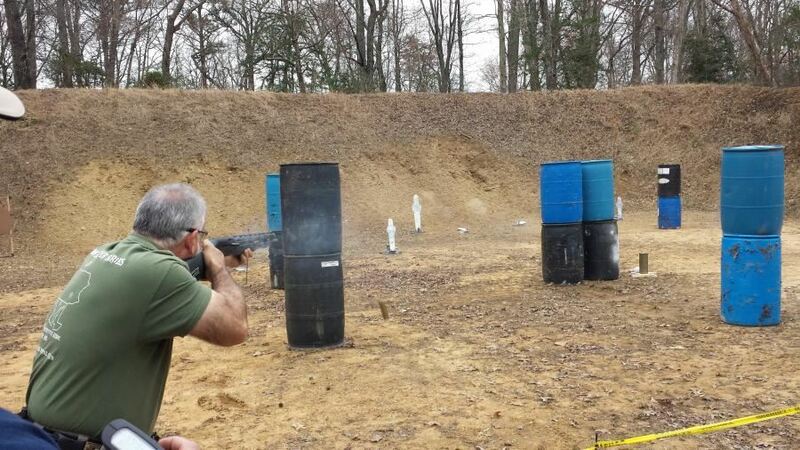 Never shot a Practical-Tactical Shotgun match before? See our Novice Info. Limited - 5 rounds or less. Sub Classes of pump and semi-auto. Open - More than 5 rounds. Sub classes of pump and semi-auto. Det-Mag - Detachable magazine. Sub classes of pump and semi-auto. Firearm: Pump or semi-auto shotgun. No maximum limit. Hunting and home defense shotguns are welcome. Please remove plugs from hunting shotguns to allow 5 shells (4+1) to be loaded. Shell holders or pouches for reloads. Empty chamber indicator flag or case for shotgun. Ammo: approximately 100 rounds of #6, 7.5, 8 or 9 shot plus a few slugs. Check match announcement for minimum round count and slug requirement and always bring extra as make up shots are allowed. At the line with safety on, upon direction from Safety Officer load as described in course description. Safety remains on until start signal. At start signal proceed through course as described. Safety on for reloads and reloads may be performed on the move. No limit on number of rounds loaded during a reload. Upon finishing, unload, show clear and insert chamber flag. Total time for each stage. Time added for missed targets may vary depending upon the stage and will be briefed with the stage description. Additional penalties may be assessed (ie failing to flip the spinner) and will be noted in the Safety Brief. Match score is combined time of all stages less penalties and missed targets. Follows the safety rules of IDPA.